I have just bought an old boxlock by this maker.Buildt on a Westley Richards action with the WR patented toplever,and dollshead.Lovely damasc tubes,and nice wood.Scroll engraved,ejector and intercepting sears.Original black powder proof.Number 2 of a pair.The address shows 277 Oxford Street.Action flats marked "Deeley ejector patent 427",and "Anson & Deeley patent 6265"
There is not much to find on E.M Reilly guns,and I will be happy for any information. Thanks to Grumpy, this is what he had to say. I don`t know if they hold the records but the current owners of the name are as below - if they hold no information then it`s a case of taking out a short term subscription to the Internet Gun Club. The Internetgunclub website is presently down due to technical issues. However if you wish to contact the owner who has a great database about most English gun makers,please PM me and I will give the email address. BTW, if it is not a problem, please do post a few photos of the gun. Pelle, I`ve had a response from John Smith containing the information he holds on the E.M.Reilly company which I`ve forwarded to you via PM. The stock is absolute beauti. Bigger pics pls, so that we can appreciate the beauty more. Do you hunt in norway? what are the hunting laws for foreigners? do you any guides there? Would love to know the serial number of your Reilly and the name on the rib. I have a feeling it might be 30364? That would be the number two of a pair. 30363 was pictured in this book. It has Deely Patent ejector use 438 and Anson&Deely action 6250 - yours has Deely patent ejector 437 and A&D action 6265. 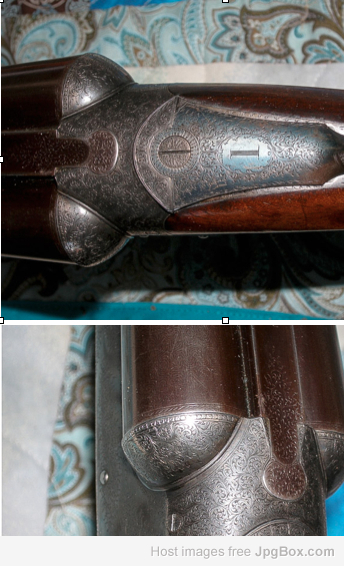 If i were you and had the facility to have a new pair of barrels made to my specifications in modern steel, I'd do so as then the gun could be used with modern 23/4' shells like all modern shotguns though I would keep and preserve the original barrel for its collectors value as its made of Damascus steel. Just a suggestion.